I like the way this dish can be eaten as a starter or part of an antipasti table, and even more as a main course, sprinkled with some ricotta salata (the deliciously salted, dried kind) or crumbled feta, or as an accompaniment to meat and fish. Each serving provides 140kcal, 1g protein, 3g carbohydrate (of which 3g sugars), 13g fat (of which 2g saturates), 2.5g fibre and 0.8g salt. Preheat the oven to 250C/475F/Gas 9. Slice the baby aubergines in half lengthways, keeping the stalks on: this is an aesthetic consideration, nothing to do with flavour, but humour me. Pour the regular olive oil into a very shallow roasting tin, sprinkle in the dried oregano, add the aubergines, cut-side down, and swirl them gently around. Then turn them so they are cut-side up and put the tray in the hot oven for 15 minutes, by which time they should be tender and turning gold in parts. 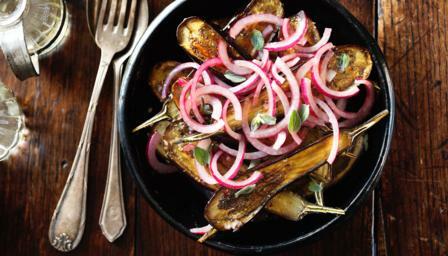 As soon as the aubergines are in the oven, put the fine half-moons of red onion in a bowl and cover with the red wine vinegar and salt. Remove the cooked aubergines to a platter, and now whisk into the vinegary onions the extra-virgin olive oil, then the grated or minced garlic and, finally, the cold water. Pour this over the warm aubergines, using your hands to arrange the glowingly pink onion over them evenly, then leave it all for about half an hour to cool to room temperature before you eat, scattering with fresh oregano, if you have any, when serving.